Modifying your instrument to achieve the results you need! Mods can be any modification to your instrument. Whether its changing the tuners, bridge, frets or finish of your guitar you can achieve a lot of great results. However in my experience mods most often refer to changes to the electronics. 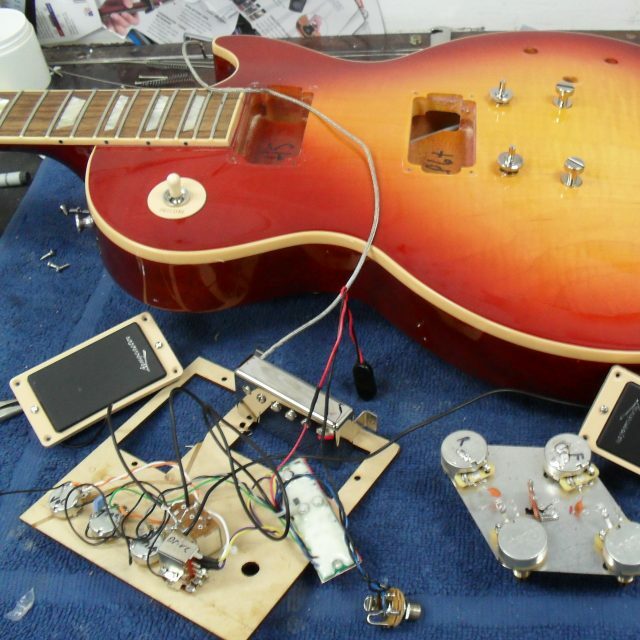 Pickup replacement is very common for getting the most out of your guitar. Often companies will make good quality bodies, with good quality parts and then install fairly low quality electronics. This helps to keep the costs down, and allows them to match price points among competitors. This is often the case with acoustic instruments as well. By recognizing this and investing in new electronics you are often able to get extremely close to replicating the tone of the same guitar, different model which would sell for hundreds or thousands of dollars more. Life’s expensive enough! Save your money, and see this as an option when buying a new or used instrument. Beyond that, we can install switches and pots that can split coils, change phase, kill signal, blend, bleed highs, retain highs etc. Basically, lots of options. We’re more than happy to talk to you so we can figure out exactly what you’re looking for. There are lots of new directions your guitar can go when dealing with sounds.